Cut up the veggies you want in it. I used white onion, asparagus, mushroom and tomato. You can put whatever else you want in it, like cheese or ham or even cooked potato. It is a great way to get rid of whatever leftover veggies you have in the fridge. Fry the vegetables in a pan (onion first, then toss the vegetables that doesn’t need much cooking in). Don’t toss in the tomatoes just yet. Crack six eggs in a small bowl, mix them with a fork and add some salt and pepper to the eggs, then pour the egg-mix over the vegetables in the frying pan. 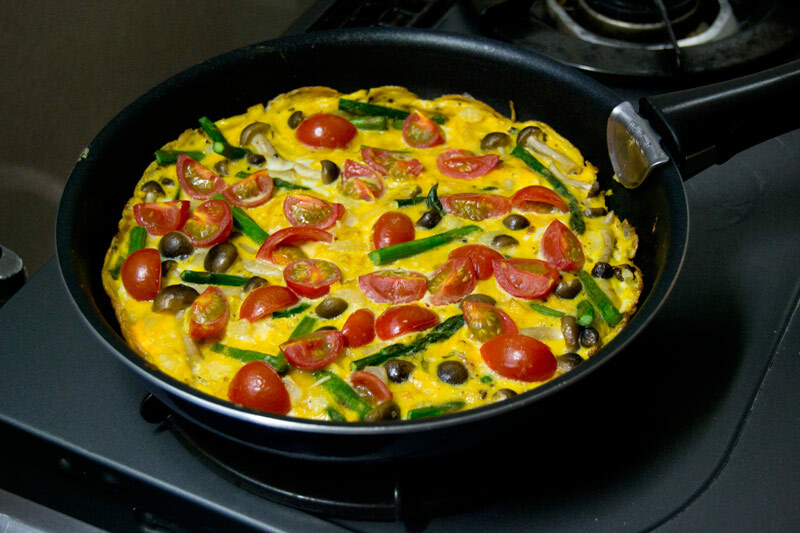 Wait until the eggs solidify around the edges and the bottom of the frittata, and then you toss the tomatoes on top, and cook it on the stove at low temperature for 5 – 10 minutes. The egg-stuff on top will still be liquidy, so I just put the entire pan in the oven for 5 minutes to make sure the top of the frittata got cooked as well. Those frying pans with the handles you can take of are awesome. Let it cool down, cut it into something that looks like pizza-slices and serve it either warm or cold. Tada! Finished! And if it is easy enough that I can do this, anyone can make this. And it even looks delicious. One day when you are not that busy, I need some help with more recipes! I am just not very talented when it comes to cooking, I have to work on expanding my cooking. Today I thought I would make raw zucchini noodle with pesto and a cold pumpkin/curry soup with sour cream. Oh dear. I mix the eggs with a little milk. It make them more “poofy”. Thank you! This is an awesome idea. If only I could find some decent bread around here, most bread in Japan is white and fluffy and not very nutritious. When it comes to egg-dishes, my friend removes the yolk and just mix the egg-whites until they turn fluffy, and then mix the yolk back in, it made it super fluffy and really good, but that seems a little bit to advanced for me just yet! Working on getting there.